The controversial proposals are finally set to become legal. 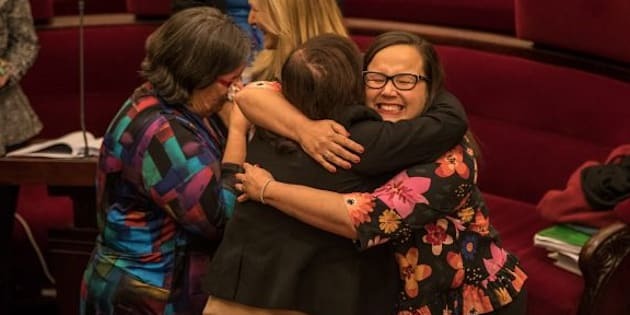 Emotional MPs celebrated as a controversial assisted dying bill was passed in Victoria's Upper House. Victoria is expected to become the first Australian state to legalise voluntary euthanasia after a controversial assisted dying bill was passed in its upper house of parliament on Wednesday. Despite fierce opposition from conservative MPs, the bill passed the house with 22 votes to 18 after a mammoth 28-hour sitting debate that ended just after 4pm. The bill will now return to Victoria's lower house of parliament for a final vote on the matter but is expected to pass into law. The change will grant terminally-ill individuals who suffer intolerable pain and have six months left to live the right to ask to end their life. Additionally, people with neurodegenerative diseases such as Motor Neurone Disease will be allowed the same right within the final year of their lives. The heated debate has seen political allies and foes face off on the matter, particularly after an extraordinary warning from former Prime Minister Paul Keating that the right to die proposal represents an "unacceptable departure in our approach to human existence". Victorian Premier Daniel Andrews has been a passionate backer of the proposed law changes, despite Deputy Premier James Merlino fiercely opposing it. On Wednesday afternoon, he told media that the bill passing the upper house is the next step in the fight for the dignity of Victorians. "It's about giving to them that control, that care, that compassion and ultimately the respect to allow them to write that final chapter of their journey," he said. "To end intolerable suffering and to give people the dignity that they have been denied for far too long." After being made legal in what Andrews expects to be a short debate in the Victorian lower house, the changes will take 18 months to take full effect. "The scheme is slated to begin, I think it's on the 19th of June 2019, so there's an appropriate amount of time, a full 18 months to get this right," Andrews said. "Whilst we can look to the experience in other parts of the world and a very limited experience in the Northern Territory for a very short period of time, part of leading the way is that you've got to do a lot of this work for the first time. "Having that 18-month implementation period, calling upon experts, having such a conservative model -- one that has been criticised for going too far and, can i say as well, has been criticised for not going far enough -- we think we've got this balance right." The Northern Territory bill Andrews referred to was in place for two years before the Federal government revoked the state's powers to make assisted dying legislation. A wave of support for voluntary euthanasia has also been spreading around the country, with South Australia introducing an assisted dying bill into its parliament for the 14th time in February, while Tasmania is expected to debate laws this year. Another bill was introduced into the NSW parliament in September, while WA is also gearing up for a debate.